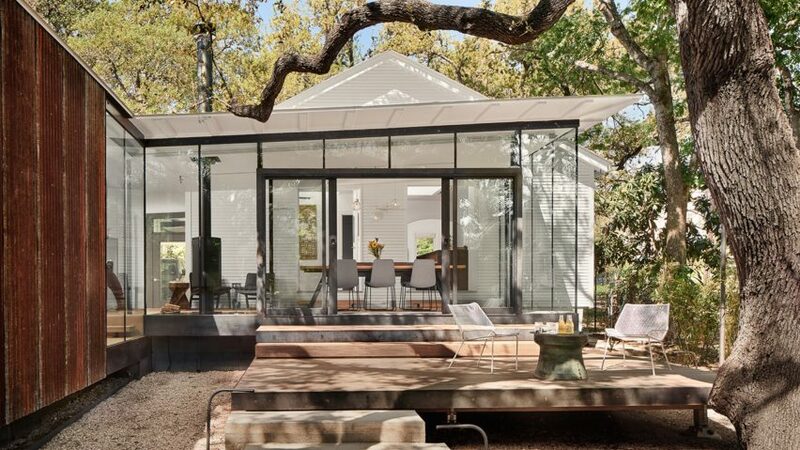 Nick Deaver Architects has added a corrugated metal extension to the rear of a bungalow in Texas, along with a new dining area with floor-to-ceiling windows. 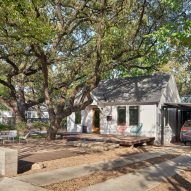 The project, titled LeanToo, entailed the addition of a structure that resembles a rusty shipping container alongside a traditional white gabled house in Austin, which was built in 1936. 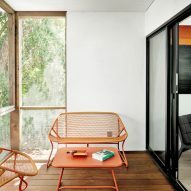 Constructed from reused galvanised metal, the rectangular extenstion adds 1,000 square feet (93 square metres) to the original 900-square-foot (84-square-metre) house. The new L-shaped plan is arranged around a canopy of existing oak trees. Local architect Nick Deaver also retained the residence's original character with a new whitewashed exterior, as well as preserved details inside. Contrasting materials guide the design, with industrial surfaces used beside traditional white teardrop siding. Another new portion located next to where the metal volume meets the old house has glazed walls, and contains a dining space and wood-burning fireplace. "Frameless glazing seamlessly meets the raindrop wood siding of the existing house, blurring the distinction between interior and exterior," Deaver said. In the back garden, a couple of concrete slabs serve as steps from the house down to a timber deck, and from this platform to the pebble-covered ground. A large dining table and water feature help to animate the outdoor area. The addition is low-slung in proportion to the existing house, and is topped with a roof that gently slopes away from the enclosed garden. The extension is also raised off the ground, allowing for water to flow underneath to the creek at the rear of the property. "The transition from old to new occurs where a modern ceiling erodes to reveal the tree's canopy and light from above," said the architect. Inside are white walls and lightly stained strip oak floors, with arches details preserved from the original home. 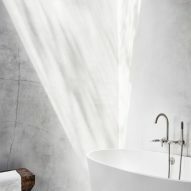 In the kitchen are soapstone countertops and a steel-plate island influenced by the work of American artist Donald Judd. The front of the property remains relatively unchanged from its original state, complete with a pebbled front garden and decked porch. Steel wickets and a thin roof form a carport, which extends from the rear extension's roofline. Upon entering are a sitting room and kitchen, with access to an office, guest bedroom and bathroom. The new glazed dining area is reached via the kitchen and directly from the car port, and links to the metal-clad addition. This volume houses a new master bedroom with a walk-in closet, bathroom and a private screened-in porch. 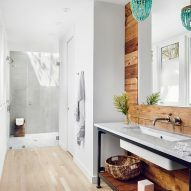 Reclaimed timber boards line the walk-in closet and a feature wall in the bath. LeanToo is one of many recently completed residential extensions in Austin, including a tiered white structure on the back of a house by Tom Hurt, a three-storey silvery cabin addition to a lake cottage by Andersson-Wise, and a new roof with clerestories for a renovated bungalow by Murray Legge Architecture.